Frank Vincent Zappa (1940-1993) was an American composer, guitarist, singer, bandleader and producer. He was one of the most prolific musicians of his time, releasing over fifty albums of original material spanning over a thirty-five year career. Born on 21st December 1940 in Baltimore, Maryland, Zappa's earliest influences were 1950s pop and rock (such as doo-wop and rhythm and blues), and 20th-century classical composers including Igor Stravinsky and Edgard Var&egrave;se. Born on 21st December 1940 in Baltimore, Maryland, Zappa's earliest influences were 1950s pop and rock (such as doo-wop and rhythm and blues), and 20th-century classical composers including Igor Stravinsky and Edgard Var&egrave;se. His output was divided between adventurous instrumental compositions and succinct, catchy rock songs with ribald, satirical, or comically absurd lyrics. On stage he demanded virtuosity and spontaneity from his musicians, and employed many performers who would later go on to achieve fame in their own rights. He directed and released a number of films featuring himself, his musicians and entourage, including 200 Motels and Baby Snakes. His career started in 1955. His earliest recordings date from the mid-1960s, and include collaborations with his school friend Captain Beefheart. In 1965 he joined a bar-band called The Soul Giants, quickly dominating its musical direction and rechristening it The Mothers. Their first release (as The Mothers of Invention; the name alteration requested by their record company) was the 1966 double album Freak Out!. The line-up of the Mothers gradually expanded to accommodate Zappa's increasingly ambitious and avant-garde music, but by 1969 he decided to work outside the band structure, focusing on his solo career, and effectively disbanding the Mothers in 1971. The beginnings of his solo career in the late sixties and early seventies was characterised by a strong free jazz influence, with albums containing little, if any, lyrical content, such as Hot Rats, Waka/Jawaka and The Grand Wazoo. Towards the mid-seventies his albums became more rock-orientated, with a combination of jazz fusion instrumentation and rock song structures. This more accessible sound bore reasonable mainstream appeal, especially with the release of the well-advertised albums Over-Nite Sensation and Apostrophe (') (which both went Gold), but Zappa's unpredictably eclectic output never led to solid mainstream recognition. He receieved uniformly lukewarm reviews from popular music publications such as Rolling Stone throughout his career. In his late seventies' output, the gulf between his humorous songs and more lengthy, complex instrumental music widened, and albums, such as Zappa in New York, Joe's Garage: Acts I, II & III, and Sleep Dirt displayed, by track, both sides firmly segregated. Zappa saw a second run of success in the early eighties with the release of many albums with predominantly comedic rock songs, but later continued to experiment with virtually every style of music through the eighties, and was productive as ever until his death. His output in this later-career period included two albums of strikingly original classical music with the London Symphony Orchestra, an electronic take on 18th-century chamber music (written by the obscure Italian composer 'Francesco Zappa', no relation), an album of synclavier compositions (misleadingly titled Jazz From Hell which garnered a Grammy award), a double-CD release of electric guitar instrumental music (the laconically titled Guitar) and a plenitude of official live releases, revisiting fan-favourites as well as showcasing Zappa's talent for reinventing the music of others; his version of Stairway To Heaven becoming a word-of-mouth favourite. 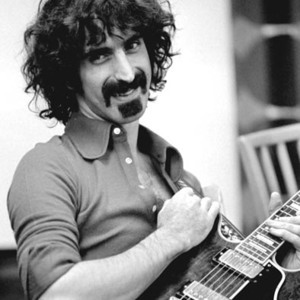 Zappa produced almost all of his own albums, spending many hours in the studio recording and manipulating tracks, and was always at the forefront of emerging technologies; from tape editing, collage, multitrack and overdubbing in the sixties to digital recording, electronic instruments and sampling in the eighties. Conversely, Zappa was also a obsessive self-archivist, recording virtually every one of his live performances, and often using live recordings of new material without needing to enter the studio. The archive of tapes at his family home in Los Angeles continues to be a source of posthumous releases for the Zappa Family Trust. He was also noted as a spotter of talent and his shifting line-up of musicians included Lowell George, Jean-Luc Ponty, Terry Bozzio, Chad Wackerman, George Duke, Mike Keneally, Adrian Belew and Steve Vai, as well as giving Alice Cooper his first break in music and working again with his old collaborator Captain Beefheart when his career was in decline. In the late 1980s he became active in politics, campaigning against the PMRC's music censorship scheme and acting as culture and trade representative for Czechoslovakia in 1989; and considered running as an independent candidate for president of the US. His death in Los Angeles, California, on 4th December 1993 came three years after he was diagnosed with prostate cancer.